If you'll be hosting at home or traveling to a friend or family member's place, keep the table service eclectic and ready for easy clean up by laying down Kraft paper that you can easily dispose of at the end of the event. It will save you laundry time and you won't be troubled about spills. Also don't worry if you have to pull out mismatched plates and use disposable cutlery – it's more festive and you'll be ready to accommodate any stragglers and unplanned for guests. Repurpose indoor furniture and create stations for drinks and food, too, so your guests will roam and mingle. Or set up seating areas for more in depth conversations. The whole idea of outdoor entertaining is to create space and enjoy the sheer joy of being out of doors among friends and loved ones. Heading to a picnic, beach party or potluck this weekend? Leave the potato salad or pie at home and show up with a big bag of ice and a pitcher of one of these summer cocktails. They're easy to pre-batch and are just as refreshing and crowd pleasing without the alcohol. 7-Up, a splash of Tabasco and a generous dose of rum or vodka. Sangria: Combine rose wine with fresh seasonal fruit, lemon, lime, orange and a splash of Sprite or club soda for some festive fizz. Sunset Punch: This one really packs a punch with a mix of bourbon, white vermouth, lemon juice, lemon slices and ginger beer. For a kid-friendly kick, try lemonade and ginger beer in place of the spirits. A summer party should be relaxed. Encourage your guests to lounge and linger and serve a simple menu of sparkling drinks and light bites that won't wilt or spoil in the heat. You can ask your guests to bring a favorite to share. After all, the idea of a gathering is to create community and keep prep and clean up time to a minimum. When gathering large office groups, international food themes are a great way to provide a connection for employees because they celebrate a variety of cultures and lend themselves well to ice-breaking games and activities. Local dollar stores often have fun, inexpensive decor and party favors to amp up the festive vibe. Some top choices for around-the-world menus are the Caribbean, Germany, Italy, Mexican fiesta, and Greek or Mediterranean flavors. Circle your entertaining area with citronella candles or incense once night falls to keep biting pests at bay and ensure that the party can go on. And put out battery-operated candles or hand out glow sticks as party favors for after sunset ambience. These items can be packed into a picnic basket or beach bag as well for your on the road and more impromptu gatherings, too. 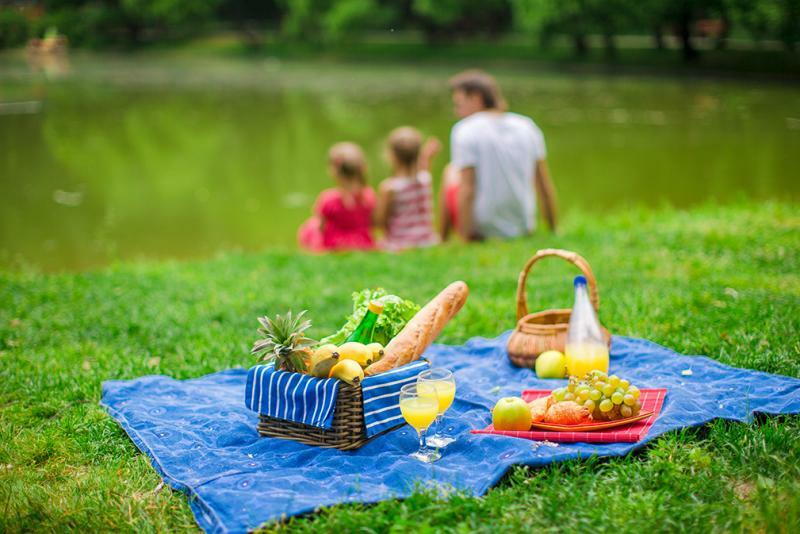 When picnicking in public spaces, a readily accessible restroom is often hard to come by, and if you're hosting an event, you'll have more traffic in your own bathroom. With Aquinelle Toilet Tissue Mist guests can keep their cool even if they have to wait in line. The lightly scented sprays transform your dry toilet tissue into a refreshing cleansing experience; and unlike flushable wipes that can clog your plumbing system, these are good for you and good for the environment. All Aquinelle products are hypoallergenic, dermatologist tested, kid safe and available in six aromatherapy-inspired scents: Ocean Breeze, Citrus Burst, Island Mist, Coco Beach, Rain Forest and Pink Grapefruit. A full size bottle is 8-oz. and the travel version is an easy to handle 3-oz. making it ideal for individual use and toting along to outdoor events all season long. Pop one in your bag and you'll be fresh wherever the day or night may take you. There's also a convenient 4-bottle gift set so you can sample several scents to find the one that's most pleasing to you.